To Surround, modernization is just a part of software development in which you put the right strategies, people, processes and tools in place to apply the same 7 Pillars of Accelerated Development. Purely Tactical – “Band-Aid” or “Lipstick on the Pig” style solutions treating the symptoms while ignoring the root causes of the problem. They are targeted at solving just one or perhaps a couple of the Top 8 Areas that Define Modern Applications. This often results in adding even more legacy code, increasing technical debt and putting greater drag on your development. That is, more technology and code that slows down development and increases your development backlog. Strategic – “Rip and Replace” style mammoth projects where you either purchase a Commercial Off The Shelf (COTS) package or set out to completely rewrite your systems. Both are tremendously expensive, have high risks and a high level of failure. Both also take a long time to implement, are very taxing on the team to support current operations while implement new and are based on business needs that have changed since the start of the project. They slow down development and increase your development backlog. It is no wonder why many companies often choose to do nothing at all. A choice based on fear and confusion. A choice that avoids the problem and they make at, perhaps, their own peril. So what can you do? There is a 3rd option! Evolve and Adapt – Change how you develop software with a strategy that evolves and adapts your legacy systems at your pace based on business-led needs. Surround Provides comprehensive modernization strategies and solutions that address both immediate tactical needs and strategic long-term modernization requirements with no limitations or proprietary lock-in. 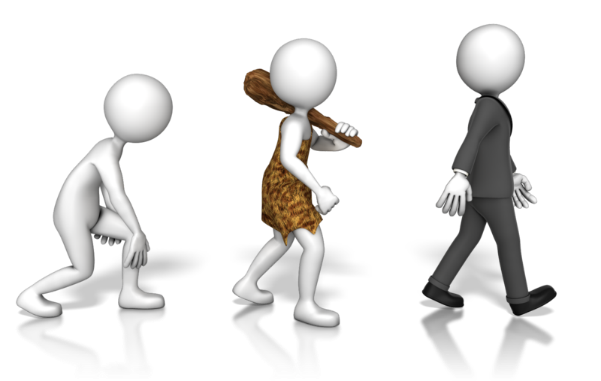 Solutions to modernize your existing legacy systems and provide an evolutionary road map to a fully modernized solution through low risk, short, agile, incremental releases. Our Accelerator solution provides significant functionality with standard out-of-the-box generation and can leverage existing legacy application without any changes to them making it ideal for customers with large custom homebrewed applications and customized legacy 3rd party applications. Of course, our solutions help with much more than just modernization. 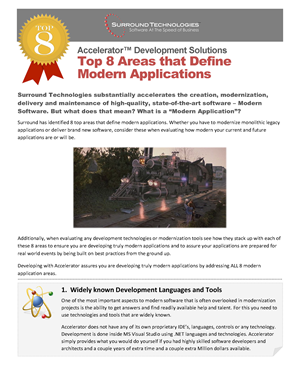 Accelerator is the only rapid application development solutions with windows, web and mobile user experiences in an n-tier agile architecture with no limitations or proprietary lock-in. 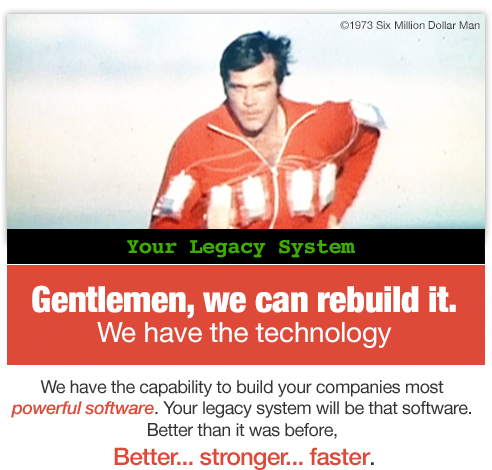 With Accelerator you surround your existing legacy technology with new, modern technology. Then, based on business need, you use as is, modernize or replace what you need when you need, retire unnecessary functionality or build new software when and where needed. And, do it all as part of a modern software development process that decreases technical debt, reduces your project backlog and keeps up with the needs of the business. refer to our Software Modernization and Transformation Products and Services page for more details on how we can accelerate your software development.